Hello, my name is Tricia K. I currently own 3 cats, Bubba is 5, Firefly (aka Bug) is 3, and Scrappy is 7/8 months old. I have been volunteering for a rescue called “Lost Paws of Lancaster” for about 3 years, fostering for about 2 years. I have worked at That Fish Place – That Pet Place for almost 2 years as a cashier. I enjoy learning new things about all animals and applying what I learn to help others. 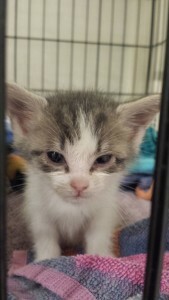 When you volunteer for a cat rescue, the season of spring is more commonly known as “Kitten Season”. This is the time of year that we begin getting phone calls asking us to take in pregnant or nursing moms and their litters of kittens. The more common call, however, is for “abandoned kittens.” I put quotes around it because more often than not the kittens aren’t really abandoned. Unlike human children, who are rarely without a parent in sight, kittens can be left alone for hours at a time and the mom usually isn’t far off. In fact, mom may even be watching you. People often don’t realize this and tend to automatically assume that mom has left the litter to starve. They then decide to take things into their own hands and “help” which isn’t always in the best interest of the kittens. Unless the kittens are in immediate danger, don’t move them. Mom may just be out getting some dinner, or taking a break. (You’d need to take a breather too if you had so many babies at once!). If you have to move them, make sure it is nearby where mom can see or hear them calling for her. Keep an eye on the nest from a distance for 12 to 18 hours to determine if they’re truly abandoned. Depending on how old the kittens are, moms can stay away for hours at a time. It can be hard to tell if mom slips in and out when you aren’t looking. A way to help tell if the mom has returned is to sprinkle flour around the area. If mom comes back she will leave paw prints in the powder. Don’t be alarmed if some of the kittens go missing. This is probably a good sign. 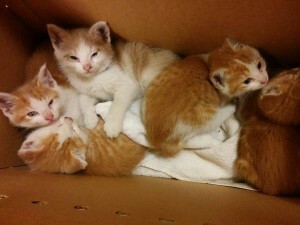 Active Moms will move their kittens from place to place if they feel they are in danger. If hours pass and the babies are dirty, fussy and loud, it is safe to consider them abandoned. It’s important to remember to wait an appropriate amount of time and to stay calm. A lot of people panic and want to scoop the kittens up and care for them right away. However, caring for kittens, especially young ones that don’t eat solid food, is a lot of work that most people aren’t prepared to take on. It is also more dangerous for kittens growing up without a mom and the comfort and milk she provides. Whenever possible, keep mom in the picture. What if Mom Doesn’t Return? What now? If you have truly abandoned kittens, and you are not prepared to take on the responsibilities of motherhood, feel free to call your local rescues. Please keep in mind that kitten season is a very busy time of year. Rescues exhaust their resources very quickly and you may be declined. Fosters for bottle babies (kittens without mommas that cannot eat solid food yet) are always in short supply because they are a lot of work. If you are able to foster the litter the rescues may have a waiting list that you can be put on to help your kittens and lighten your load. Even if the rescues can’t take in your litter they may have tips and tricks to make your go at being a momma cat much easier. This Kitten season, Please be patient and do what you can to help appropriately. While it’s hard to resist a pile of adorable, cuddly kittens, letting Mom handle their care is sometimes the best option. Given the recent reports of the canine flu outbreak in the Chicago area, we wanted to put together a few simple tips for helping to prevent or detect if your dog has the virus. Q: Where have cases been found so far? Q: How can I tell if my dog, or if other dogs, have the Dog Flu? 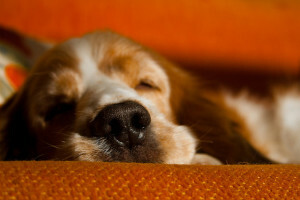 Q: How can I Help Stop My Dog From Getting Sick? A: The virus is very contagious. The best thing to do is to avoid potentially exposing your dog to a dog who might be sick. Q: Can people catch the disease? A: No, people can not contract the disease from their dogs. They can, however, help spread it through contact with surfaces. For example, the virus can live on surfaces for 24-48 hours. If you pet a dog and then touch a counter top, it is possible to spread the contamination. Washing your hands and sanitizing is always a good idea in these cases. Q: Has this happened before or is this unusual? A: Dog Flu outbreaks occur relatively frequently. The fear with this one is that it’s a new strain that dog flu vaccinations may not prevent. If you have any questions about the Dog Flu – please consult a veterinarian. Hi Pet Blog Readers, It’s been a long hiatus since my last post but for a good reason. 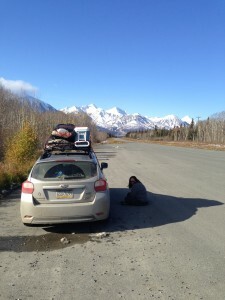 My husband and I sold everything and followed our hearts and dreams to Alaska, The Last Frontier. I know it sounds crazy, it felt crazy! It was an incredible journey to get to my new home in the 49th state, and that’s what I’m here to tell you about. 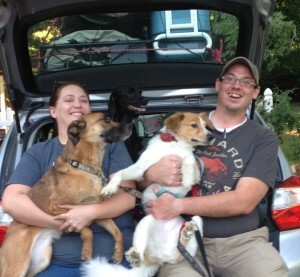 3 dogs, 2 adults, 1 Subaru and enough belongings to get by for 2 months; we could have been a very entertaining Subaru commercial, had there been any room for camera equipment! 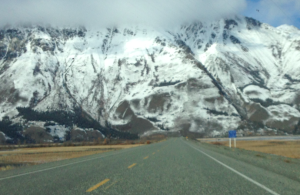 The 4,579 miles from our lifelong home in Lancaster, Pennsylvania to Chugiak, Alaska would take just over 6 days to complete, with no time for sightseeing. That kind of a journey doesn’t just happen on a whim; it took months of careful planning and preparation to ensure our safe journey across North America. 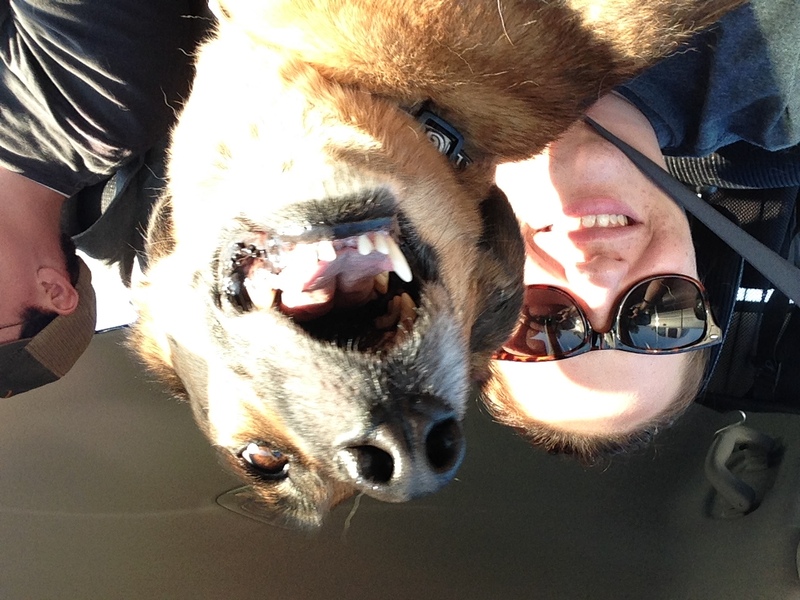 I’d like to share some of the lessons I learned driving cross-country with my dogs. Safety is the number one concern for driving cross-country. Our dogs are notoriously rambunctious in the car and we feared having to battle to keep them in the backseat while driving on a busy highway. I researched backseat barriers and travel harnesses at length. The harnesses didn’t appear to be a good option for us because we would have three dogs in the backseat for days at a time. We didn’t want to limit any of their sleeping options; like the floor of the backseat. We didn’t know if they would tangle themselves while racing from window to window, and we didn’t have time to experiment. So, instead, we opted to install a backseat barrier. Being cost-cautious and of the mindset that any visual barrier would deter our dogs, I chose a mesh one with buckle fasteners. We did test drives using the barrier with success in our home town. 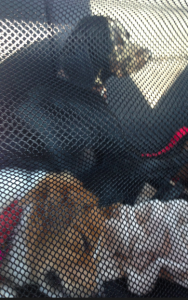 However, once we boarded the car with our luggage, everything changed and the dogs became more aware of every weakness in our system. If I had it to do over again, I’d gladly shell out the extra cash for a solid barrier properly installed in the car. 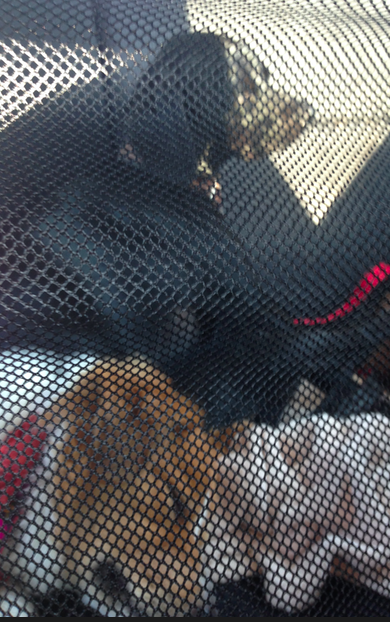 Within the first 5 minutes, Gatsby and figured out how to maneuver into the front seat, the other two not far behind. We had to sacrifice some shoelaces to shore up the weak points. We found a large cup that fit snuggly into the backseat cup holders. Every time we stopped we filled up the cups in the back and the dogs could drink whenever they needed to during the ride. It was messy, but effective. If you can, leave enough space in your luggage for 1 gallon per 3 days of water using the water that your dogs drink at home. I should have taken 9 gallons of water, but I only stashed 3. 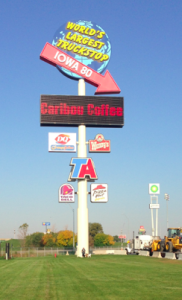 I assumed I would refill at hotels and stops along the road. The reason for storing their regular drinking water is to avoid the very slight chance that the dogs would get sick; caused by the different chemistries of water from state to state. We were also traveling through remote areas of Canada and I didn’t know anything about the water quality in that region. I wish I had taken more water not because of the water quality but because I forgot to refill our gallons more than once. This oversight caused us to need to purchase spring water from the next gas station; an unnecessary expense in added to an already expensive trip. We packed enough dog food for our trip, plus one extra week. We had one week of food left when we got to Alaska, and the two local pet stores don’t sell our brand! Gasp! Traditionally, to avoid gastrointestinal distress, you should slowly wean your pets off their old food and on to a new food over a period of 1 to 2 weeks. I didn’t have that kind of time. We used the three or four days we had to wean them faster than usual. Luckily, we averted dietary-disaster and the dogs transitioned to a new food without much more than some extra gas. I would’ve appreciated more time to properly research my options and transition to a new dog food. Bring some of the comforts of home. The keyword there is ‘some’. The small collection of toys and dog chews quickly became overkill and a burden in our heavily laden car. Maybe pare it down to one favorite toy or chew per dog plus a thin blanket. I let my guard down. I was tired after long days of riding in a car. I checked us into the hotel, entered the room, removed the dogs’ leashes and got ready for bed. I forgot, however, that my husband would be bringing some of the luggage into the room in a few moments. The card reader beeped and the door opened. In a blur, all three dogs were racing down the hall into the lobby and towards the front door before we had time to react! One of my dogs is skittish and the first slight noise sent her scurrying back to me where I held onto her collar. My husband ran after the two excited escapees and was able to herd them back into the hallway where I could lure them back into the room with desperate offerings of treats and food. We travelled across 4 time zones, but our dogs were still hungry at noon instead of 4:00pm. Prepare for some transition time. I had the misfortune of coming down with mild food poisoning during our trek through Canada. I would have been in trouble if I were traveling alone. Thankfully my husband did not suffer this fate and was there to help with the dogs and all the added stress that they bring to a cross- country car trip. I could probably continue to write about this for days and still have advice left to give. All in all, we were very well prepared and made it safely without any major incidents. The lessons we learned were infinite, and I’m sure yours will be too. I can sum it up with one statement: It was an adventure that I wouldn’t be quick to repeat; but one I wouldn’t trade for the world. I’m really interested to hear if any of you have your own tales of the road with your furkids and any lessons you’d like to pass on to fellow travelers? Reply below. Safe travels, everyone! Here at That Fish Place – That Pet Place – we always try to assist local rescues and pet organizations whenever we can. I have personally been on the forefront of this for the last few months in my position as the Local Community and Events Coordinator. 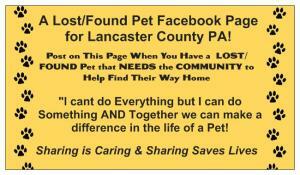 There are a lot of rescues in and around Lancaster County. As a pet lover, chances are you are either involved with a rescue or you may know someone who is. Promoting a rescue or other non-profits can be expensive – but it doesn’t have to be. There are many national event posting sites, as well as local Lancaster, Pennsylvania sites. Not from Lancaster Pennsylvania? Do a quick Google search using the keywords “Event posting sites” and your current location. It’s that easy! 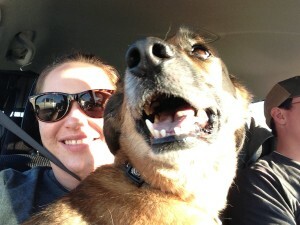 Below are 6 FREE ways that I have found to promote your rescues events online. In order to promote an event on Yelp, you must first sign up as a business. Signing up for Yelp is absolutely free. Once you are signed up, you can add an event by simply clicking on the events tab and inputting the information. The advantage to using this site is that you can search for an event by category and locale. The other added bonus is that you can get feedback regarding your event if an attendee submits a review. This can help you plan future events. Eventful is another site that is 100% free. You can create an account, or log in with your existing Facebook. Once you have added your event, you can add imagery. 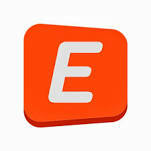 The added bonus by using Eventful is that each event can be tagged to up to three categories. The more categories selected, the more your event will populate when people search the website. Event Brite is a great site to use if you like to keep track of how many people plan to attend your event. There is no charge for selling free tickets on Event Brite. Simply create an account, and add your event. You can use Event Brite for paid admission as well, with the option of deducting the transaction fee from each ticket or adding the fee to each ticket. The event is still free to post, and any transaction fee will get applied before deposit to your PayPal account. Attendees can use any major credit card. Event Brite would be a huge benefit to your large scale event. Pennlive is an online distribution of the Patriot News, which is directed to Central Pa. Adding an event is simple and you do not have to create an account to do so. You can also link a previously posted event from another site (like Facebook) by adding the additional URL to your event submission. 360lancaster is another great event source. The process of entering the event is simple with your audience retaining to Lancaster County. Would you like to expand your audience? Check out 360York. The added bonus to this page, there is a Lancaster Nonprofit organization category. Thus making your event highlighted in one easy click. Susquehanna Life makes it really easy to submit an event. Simply create an account or log in with one of four existing social accounts (Facebook, Google, Yahoo, or Windows live). The reach for your event is throughout Central Pa and Susquehanna. Event postings are free, and their customer service is amazing. With all of these sources at your fingertips, why not take advantage? Our generations X ways are the things of yesterday. It is time to move it on up to the digital era. Personally, I could do without all of the paper cuts. If you would like to know more about posting your event on any of these sites or if you have any questions about promoting your rescue please feel free to contact me at tries@thatpetplace.com. Thank you! The author’s posts are entirely his or her own (unless of course they’ve been hypnotized by their pets) and may not always reflect the views of That Fish Place – That Pet Place. A lost or runaway pet can be a serious and stressful experience. Since 2012, Help Find Sophie has used their Facebook page to assist Lancaster County residents reunite with their furry friends. It is important to help because, let’s be honest, even the most responsible pet owner has the occasional “oopsie”. For the past few weeks, we have wrestled with this great opportunity to spread awareness. How do we, in one small blog, highlight the vast experience and knowledge we have gained in the hundreds of reunions of which we have been a part? We could utilize our word limit by reminding you to lock your dog or secure your leashes. We could also suggest better maintaining your fences. Or to stop asking the teenage girl from down the street to house sit, when we know she’s more concerned with watching television than your pet, which has already scaled the backyard wall. Ultimately, we picked three simple actions that we feel are more important than minding that broken fence post that you were SURE Scruffy couldn’t fit through. Keep the tags on your pet’s collar! Yes, the jingle of that current rabies tag is possibly the most annoying noise you’ve ever heard (specifically at 2am when your cat decides to have a techno dance party with that moth that flew in your window). But seriously, just do it. Did you know that all vets register those foreign numbers in a database that can be tracked back to you? We are serious…it’s true. Keep your pet’s rabies tag on for bragging rights, too. Update if you move. Update if you change your phone number. Update if you have inherited your great uncle John’s Pomeranian after he went to live at Whistling Breeze Retirement Home. It’s not hard. Just call the chip company. Call your vet. You wouldn’t move without telling the post office where to forward your mail, would you? You wouldn’t leave for a week in Bahamas without setting up your work email to auto-reply, would you? NOPE….so get on the phone and update Scruffy’s contact info. And no we don’t mean with the pink collar with sparkly fake diamonds (Any unique collar that could be used to identify your pet could easily slip off while your pet is loose). But really IDENTIFY your pet with an implanted micro-chip. DO it now! Get up! Heck, you can even stop reading this blog right now….and get your pet micro-chipped. There are clinics in Lancaster County that run specials offering micro-chipping for as low as $25. That’s less than the pizza and wing special that you will probably order for football on Sunday. Micro-chip!–It’s easy. It’s like giving your pet the voice you sometimes wish they had. Imagine this scenario: Scruffy runs off to check out the new neighbors, who happen to have a new poodle. Scruffy, who may have collected a few briars and encountered a mud puddle or two, looks like a possible stray. Your new neighbors, unaware of Scruffy’s curious nature, scoop up your little man and assume he needs shelter. Now wouldn’t it be ideal if Scruffy could speak up and say “Hey I’m just here for the poodle, my name is Scruffy and I live down the street? ?” Well guess what, Scruffy can’t do this. And if he can please contact HFS immediately as we would LOVE to meet with you and promise not to exploit your dog for our own profit. 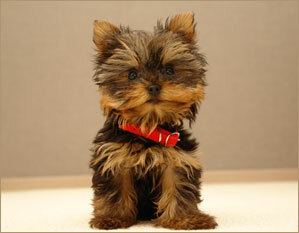 ☺ But…just but what if…Scruffy would have a micro-chip? And these new neighbors take him to the local vet and have him scanned? Scruffy now has a VOICE. He now has an identity. And you will get the phone call that Scruffy is safe and sound hanging out with the poodle up the street. IT’S THAT EASY. Help Find Sophie was started in 2012. It was created after a beautiful boxer named Sophie went missing in our county. In a matter of days the number of likes topped a hundred. Lancaster Contains were out in groups, searching for this sweet girl as if she was their own. The number of concerned people that answered the call for help was overwhelming. Unfortunately Sophie did not have a happy ending and she passed away after being hit by a car. For several weeks the site went untouched and the community mourned. Then, requests started coming in. 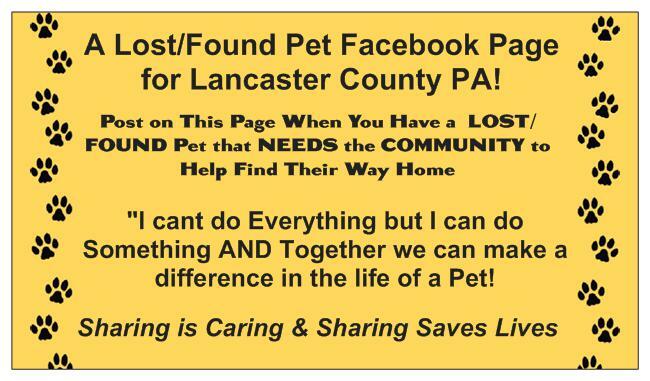 Other Lancaster County residents began asking to post info about their lost pet. Little by little the page grew. Sophie was in everyone’s thoughts as each reunion unfolded. She became the legacy. Members often asked, “Sophie please help lead my friend home,” or told us, “Sophie was watching out for this pup.” So how could the page be deleted? Hundreds of followers became thousands. New members joined each day, some who needed help searching and others who wanted to offer their time to help search. Help Find Sophie became more than just a Facebook page looking for Sophie but now a family of members who will look out for each other. Friendships have been made. A small portion of our faith in humanity is restored every time we hear that member is out at 4am searching for a missing dog. Or that another member has rented traps to catch a cat that has been on the run for a week. IS HELP FIND SOPHIE HERE TO SAY? So please please Spay, Neuter, Microchip!!!! I can’t do EVERYTHING but I can do SOMETHING and TOGETHER we can make a difference in the life of a pet. 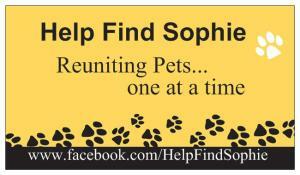 A full list of helpful tips can be found on the Help Find Sophie Facebook Page. Like us! This blog did not mention the importance of spay and neuter because come-on…you guys are smart. You don’t need us to tell you that there are plenty of friends who need homes. Besides Presidents, their First Ladies and children, dogs have resided at 1600 Pennsylvania Avenue as well. It is no wonder that dog ownership is so high amongst the Presidential club. Unlike their political foes and “allies”, dogs provide loyal companionship that isn’t dependent upon the latest Gallup Poll or focus group. The first President had 36 dogs. 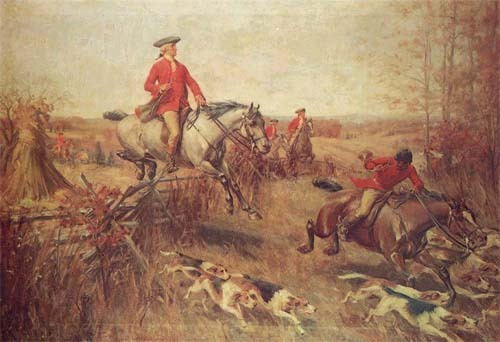 George Washington’s favorite breeds were hounds and he used them extensively on fox hunts. The Father of Our Country, Washington can also be considered the Father of the American Foxhound. 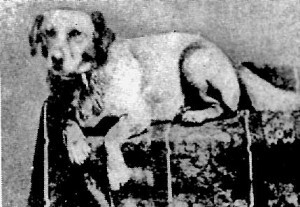 Washington bred his hounds with the French variety, creating a new breed that survives today. Besides being the only bachelor to have become President, James Buchanan had the heaviest dog to ever occupy the Whitehouse. 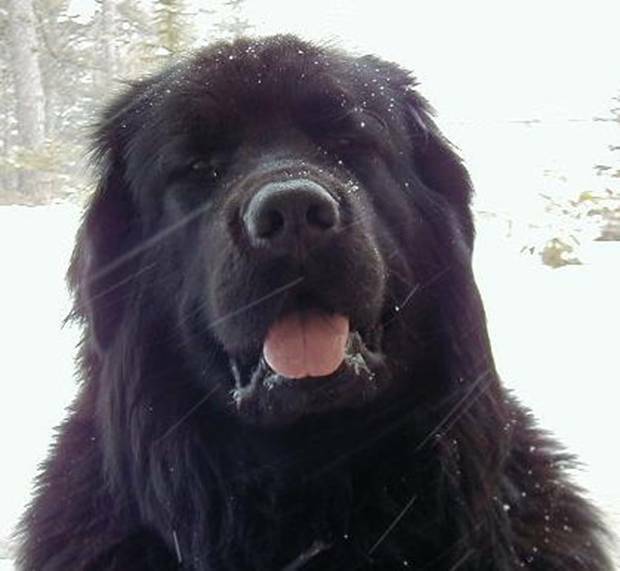 Lara, a Newfoundland, was 170 lbs. Perhaps that was the reason he remained a bachelor. The only dog to have a statue in a national monument is Fala, FDR’s Scottish Terrier. The statue of Fala is a fixture in the Franklin Delano Roosevelt Memorial. 2. George W Bush’s Internet Sensations! 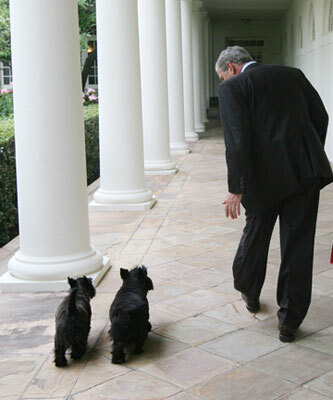 Barney and Miss Beazley, First dogs of George W Bush, were the first presidential dogs to have their own website. The name Fido is a stereotypical generic name for a dog. But why is that? Fido has a Latin base meaning “I trust” or faithful one. The President who came up with that name for his dog was none other than Abraham Lincoln, one of our most beloved Presidents. It’s finally Friday, but before we get to the weekend we have a guest blog from Richard. He has written an informative post detailing what your pet guinea pig needs for a healthy diet. 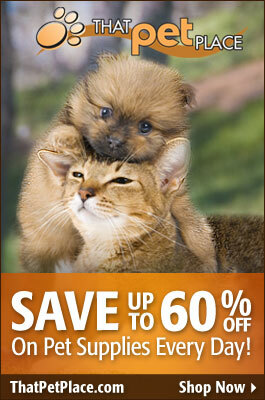 Your furry friend has important dietary needs and you are the one to help them fill those needs! If you have any questions or comments please let us know, they are always welcome! Have a great weekend! A guinea pig’s diet is fairly simple. In the beginning, owners just need to follow some guidelines and test out different treats when their pet first arrives. The diet of the guinea pig should be made up of fresh fruits, vegetables, commercialized pellets and timothy hay. A proper diet should consist of fruits and vegetables, but in moderation. If you give your guinea pig too much, they will probably have diarrhea, which is potentially very dangerous to your pet’s health if it persists. Try out different types of fruits or veggies to see which your pet likes the most. After you’ve found a few, stick to those in their diet. Some I would highly recommend include: apples, kale, spinach, carrots, blueberries, peaches and tangerines. It’s okay to switch out a few every now and then, but always research first to see if they can actually eat it. Here are some foods that you need to keep away from your pig: iceberg lettuce, corn, potatoes, chocolate, “human treats” and raw beans. Don’t just stick to this list alone, there are many other foods they should avoid. Remember to always do your research first. 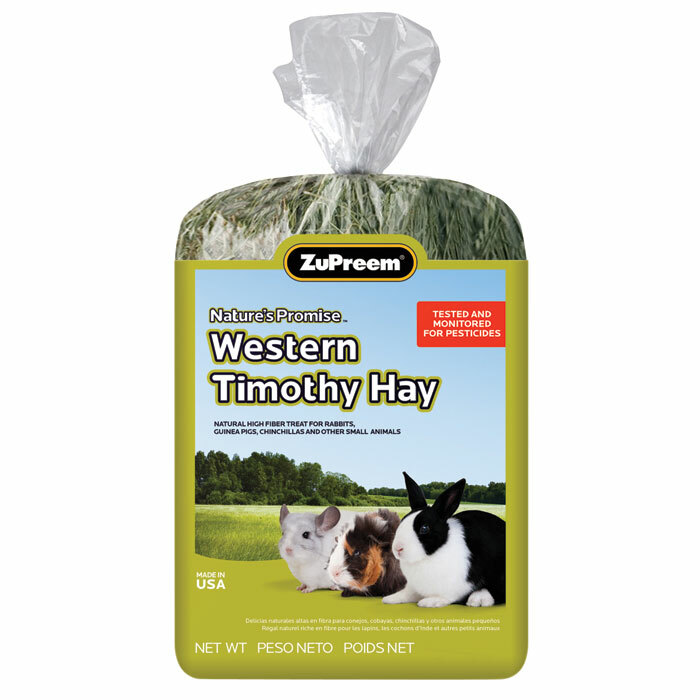 Probably the most popular Cavy food, Timothy hay should make up the majority of your guinea pig’s diet. Yes, you heard right. Your pet can eat the same Timothy hay that is recommended as bedding for guinea pig cages. Now, if you plan on using Timothy hay for your bedding as well, I would get a hayrack to clear up any confusion for your pet. You want to separate hay that is used as bedding from hay that is used for eating. Make it clear to them by putting treats or pellets inside the hayrack mixed-in with the hay. That way, they’ll know food belongs in that rack. In the previous section, I mentioned that too many fruits or vegetables could cause diarrhea. If that happens, simply increase your pig’s intake of Timothy hay and it should go away. This is because this type of hay helps with digestion. When looking into food pellets at your local pet store, find a product that is 20% protein and 16% fiber. Also, make sure to look for Vitamin C in these products. Guinea pigs need Vitamin C because, like humans, they can’t produce any themselves. A lack of vitamin will surely lead to health problems in the future. If you can’t find pellets with any, just buy them tablets and feed them about 10mg per day. Do not feed them multi-vitamins, as excess in the other vitamins can potentially be dangerous to them. When you first start feeding your guinea pig, pick a time that is convenient for you. You want to get them in the habit of eating food at a certain hour of the day. These critters depend on a set schedule and will often make some sort of commotion if that schedule is broken. Try your best to not be more than an hour early or late when it comes to their diet schedule. Just follow these simple guidelines and you’ll have a diet plan designed for a healthy piggy. I also want to note that these diet plan tips can be applied to all guinea pig breeds. And remember, when in doubt, research to see if your pet is allowed to eat it. The last thing you’d want is to poison your new friend. Richard James has been caring for guinea pigs for over 15 years. He is the author of the care guide, “Guinea Pig Care Made Easy,” which has helped many owners raise a healthy pet. He currently owns 3 guinea pigs: 2 Silkies and 1 Peruvian. 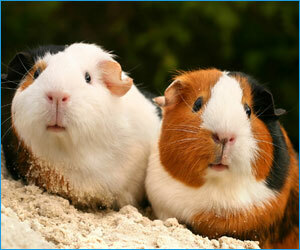 Check out his website for more valuable information about caring for Guinea Pigs. Vacations are great: time for rest, relaxation and recharging. However, some pet owners, including myself, feel guilty leaving our furry friends behind while exploring other parts of the country. I’ve discussed hiring pet sitters and boarding facilities before, but there is another option. 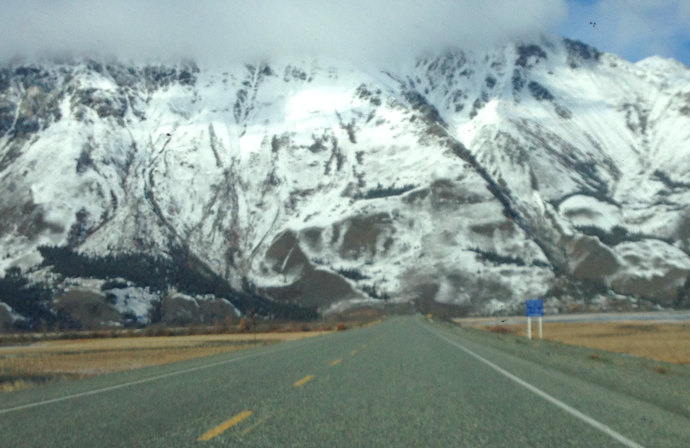 Consider it the road less travelled. 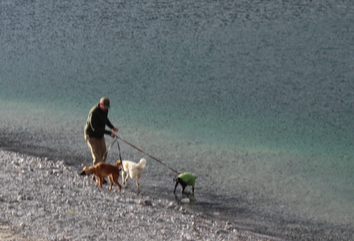 What about taking your pets with you? Air travel can be expensive and sometimes dangerous for short-nosed dog breeds. What about a good old-fashioned road trip? 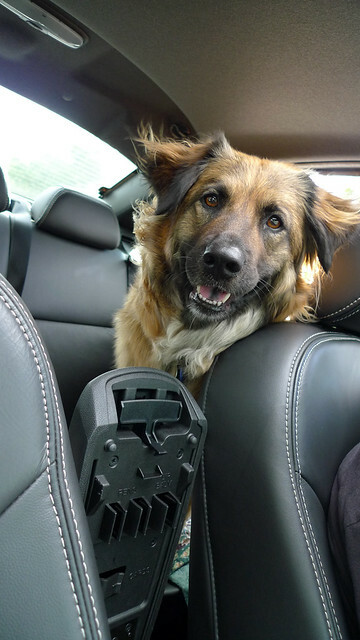 After you read this, you might reconsider that boarding facility or pet sitter, but for those instances where you really want to share the road with your four-legged best friend, this post will be your go-to resource for planning the perfect road trip. 1. Get the all-clear from your vet. Schedule a well-pet visit for any of the pets that you’ll be taking on the road with you. If you’ll be travelling across the Canadian border, make sure you have copies of your current rabies vaccination certificates. Make copies of any other vaccinations and check with the places you’re staying to make sure your pets are up to date on any vaccinations that they require. 2. Plan your route carefully. Pet friendly hotels are more and more common, but you’re going to need to plan ahead. Don’t just rely on a hotel’s information online, make sure to call ahead and get confirmation that your pets are welcome. You may want to consider camping during your trip or renting an RV for a cross-country trip, especially if you have multiple dogs or large breed dogs. You still need to call ahead and make sure that your pets are welcome. As unfair as it is, some breeds aren’t allowed in some counties, hotels, or campgrounds. 4. Make sure your microchip information is up-to-date. If your pet isn’t microchipped, make sure to get one done at your vet’s office. If they are already microchipped, update your information online to include your cell phone number in case they escape while away from home. 5. Practice makes perfect! If your dog isn’t used to car rides, take small trips in preparation for the long haul. Slowly build up the amount of time that you’re in the car until you’re confident that your pet will tolerate a long road trip. While you’re on the road, make sure to give plenty of water and stop every few hours for a stretch and to relieve them. Take a short walk at each rest stop to reduce anxiousness. If you can, go for a run or do some exerting activity so that they’re nice and tired for the next leg of the trip! 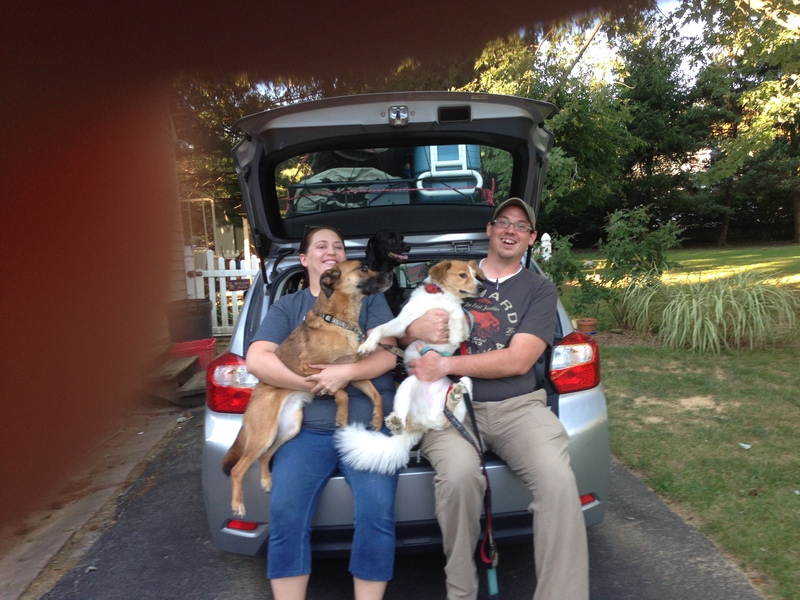 Do you have any words of wisdom for any pet lovers getting ready to go on a road trip with their furry companions? Leave them in the comments! Hi Pet Blog Readers! As we eagerly anticipate the weekend, we have an article from guest blogger Sam Buddy. 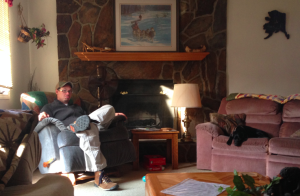 He has written a nice post about bringing a new dog into your home. Housebreaking a new pup or dog can be a trying task. Sam has a few ideas that should help you get prepared for the new addition to your home. If you have any questions or comments, or any new puppy housebreaking ideas of your own, let us know in the comments section. Have a great weekend! He’s so fluffy, you could die! The latest addition to your family, a lovely, furry little thing that can literally turn you into that overexcited little girl in the movie “Despicable Me” – he’s so great for cuddling and nuzzling. All of you are likely to be blindly in love with the puppy for, at most, a week. After that, all members of the family will be pointing fingers at who should have the turn to take the cutie out for a tinkle or a poop session. You all love the pup dearly but he will prove to be quite a handful and a big challenge for the family. One of your responsibilities as new pet owners is to housebreak your pup. This way, before his natural temperament completely takes over and habits form, you can lead him to the right path of development that will not only benefit him but also your whole family. 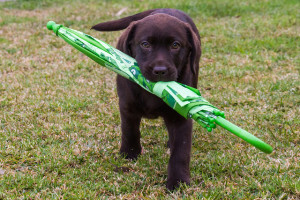 To housebreak the doggie and protect your home dynamics and relationship, here are tips from trusted professional breeders of purebreds and designer dogs, Chevromist Kennels. Do your homework. Learn more about the specific breed of your puppy because their breed will determine their characteristics and developmental needs. Knowing these things will allow you to modify your own behaviours as primary care providers, and even your home design. Designate places for your puppy’s daily routine. Chevromist advises pet owners to make sure the dog has a safe place to relieve himself. Over time, this specific area will tell your dog that it’s where he can do his “business” comfortably. Install convenience and safety features for the dog. These will allow him to create and stick to the routine easier so even if nobody’s home to take him out to urinate or defecate, or give him food, he can still smoothly go about his daily activities. Be patient. Habit formation takes time and patience; dogs are sensitive beings and the way you deliver instructions and your reactions to them impact their ability to learn important lessons. Screaming at your pup or rushing him while he’s trying to relieve himself will stress him out and make it harder for him to work with a routine, to trust you, and at times, it may even cause him to lose control over his bodily functions. Reinforce good behaviour with rewards. This is an essential part of dog training and this doesn’t need to be an edible treat all the time; extra cuddles, loving coos, affectionate pats on the head will have the pup learning necessary behaviours, like going outside to relieve himself, that would earn him such treats. About The Author: Sam Buddy is a pet owner and a freelance writer. He feels a special connection with his pets, most especially to his dog. He treats them as part of his family. He even brings his dog with him every time he travels. He spends most his time learning and sharing informative content about pets. Sam uses this resource for helpful pet care information: http://chevromistreviews.com.au/.